Drew Anthony Smith/Getty ImagesRep. 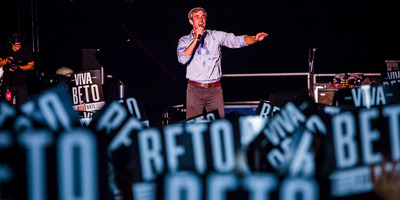 Beto O’Rourke speaks at a campaign rally in Austin, Texas. Rep. Beto O’Rourke, the Texas Democrat challenging Sen. Ted Cruz, raised more money in the third quarter of this year than any Senate candidate ever has. Drawing $US38.1 million from over 800,000 donors, O’Rourke raised more than three times what Cruz did, despite the incumbent’s lead in the polls. But many warn that even staggering sums of campaign cash might not be enough to turn a deeply red state blue in the 2018 midterms. Rep. Beto O’Rourke, the Texas Democrat challenging Republican Sen. Ted Cruz, raised more money in the third quarter of this year than any Senate candidate ever has, his campaign announced Friday. Drawing $US38.1 million from over 800,000 donors, O’Rourke raised more than three times what Cruz did, despite the incumbent’s lead in the polls. But Cruz’s $US12 million in donations this past quarter is still a sizable haul for a Senate race. While O’Rourke has outraised Cruz all year, his latest numbers shocked politicos and Democratic operatives. Jessica Post, executive director of the Democratic Legislative Campaign Committee, noted that the candidate raised $US3 million more in the last three months than her organisation budgeted for the entire 2018 election cycle. “And we more than doubled our budget from the 2016 cycle for 2018,” she tweeted. Others pointed out that O’Rourke’s haul topped the $US23.5 million that then-Sen. Barack Obama raised in the quarter leading up to the 2008 Iowa caucuses and New Hampshire primaries – and it also exceeded the amount former Florida Gov. Jeb Bush raised for his entire 2016 presidential bid. Some Democrats argue that while O’Rourke has run a more promising campaign than any Democrat has in the red state in decades, his campaign donations would be better used elsewhere. Still others pointed out that money, even vast sums, does not necessarily translate to wins – a prime example being Democrat Jon Ossoff’s failed 2017 special election bid for a Georgia House seat, which was the most expensive House race ever. “Imagine what that $US38 million could do in races where Dems aren’t going to lose by 8 points,” tweeted former Democratic staffer Caitlin Legacki, referring to recent polls that show Cruz leading by anywhere between five and nine points. Unlike Cruz, O’Rourke has banned donations from corporate political action committees, making the size of his campaign war chest that much more impressive. The last Senate candidates to come anywhere close to O’Rourke’s fundraising numbers were former Rep. Rick Lazio, a New York Republican who raised $US22 million in single quarter in his 2000 Senate race against Hillary Clinton, and Sen. Elizabeth Warren, a Massachusetts Democrat who raised $US12.1 million in a quarter in 2012. But even if O’Rourke loses, the seemingly unprecedented enthusiasm behind his bid makes it unlikely that Texas – or the country – has seen the last of him. “If this Senate race doesn’t work out, there’s one in #2020 that might be of interest…,” tweetedNPR politics editor Domenico Montenaro.